Leaving the Sachsenring early the following morning after what we felt for us, was a good meeting, not with standing my early 350 race retirement and non start in the 250 event. We headed for the UK as quickly as possible as Vic and I were both looking forward to getting home and having a good rest before setting off to Dundrod in Northern Ireland, for the next World Championship meeting on our schedule. I was also keen to meet up with Ron Kenwood to see what solutions, if any, he had come up with or might be proposing in response to my request for help in dealing with our need for more power from the 125 and gearbox issues, all as I had listed and mailed to him from Shleiz. Having reached the Port of Calais and loaded the Thames onto the ferry for Dover, we felt almost home and were relaxing over a good meal and a glass of wine on the ferry not realising there would be yet one more hurdle to overcome before finishing our journey! We arrived at Dover on a Spring tide to find the tide was out and thus the ferry off loading ramps so steep that only cars were being permitted to disembark until the tide turned. The Thames was parked in the ships hold at the front of a long line of cars unable to move with us in front of them. Being also anxious to get off the ferry, we agreed with the crew to try to see if we could get our fully loaded Thames up the ramp. Well, after a lot of clutch slipping and smoke we succeeded in getting up the ramp only to discover, as we tried to climb the hill out of Dover 10 minutes later, that the Thames clutch had completely gone! This was within less than a 60 miles of home, having covered nearly 7000 miles traveling across Europe over the past 4 months, with only an oil pump gaiter and seal failing on the Thames, in all this time! Fortunately we were able to get off the hill by backing down into a garage forecourt, unfortunately however, being late in the evening, the garage was closed. Determined to get home and Vic to see his girl friend, we locked up the Thames with the bikes, spares and tools, put a notice on the windscreen informing the garage owner of what had happened, with a promise to contact him first thing the following morning. We then took a train home to Woking via Waterloo, hitting our beds just after midnight. Leaving Vic on the following day to pacify the owner of the garage in Dover and to arrange to have the Thames clutch replaced, my long time friend and fellow racer John Bacon gave me a lift over to Ron Kenwood’s in Puttenham on the South side of the Hogs Back. I was very surprised and pleased to find Ron had already done a lot of work, manufacturing new components to the specifications we had originally planned, for the 125 short stroke engine. 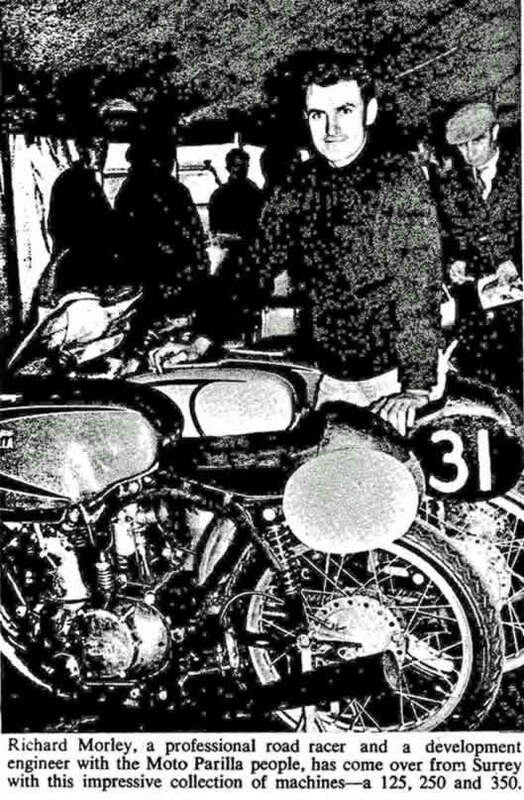 Over the winter of 1963, I had many discussions with Ron, when we developed at length the ideas for modifications I was considering making to each of the bikes, on our arrival at the Parilla factory in Milan. These plans included the building of the short stroke 125 engine and the possibility of manufacturing a 6 or 7 speed gear cluster for this engine only, based on a 5 or 6 speed gear cluster I had modified and installed for Peter Lucas’s in his 50 cc racer in 1961/2. The Lucas racer gear cluster was also constant mesh with internal gear selection but unlike my G50 gear cluster design, the sliding drive gears were locked to the main input shaft, on selection, by the internal main shaft selector piston moving side ways pushing ball bearings up into the inner cups of the selected gear. We would not have attempted to use this gear cluster design in any engine over 125 cc and there was still a big question mark in our minds, at the time, as to the torque capacity and long term durability of this design, even for a 125 engine with less than 16 horse power !! With the help of E.H.Macey of Chertsey and other local engineering workshops Ron had also completed, with the exception of the indexing mechanism, the manufacture of the constant mesh cluster developed from the Lucas 50 racer design as described above, for the short stroke 125 engine. I was completely bowled over seeing all of the work Ron had done in such a short space of time and by the superb quality of all the components he had made and assembled including the Morini racing piston and pattern con rod which, as required, was longer than the standard 175 Parilla con rod. 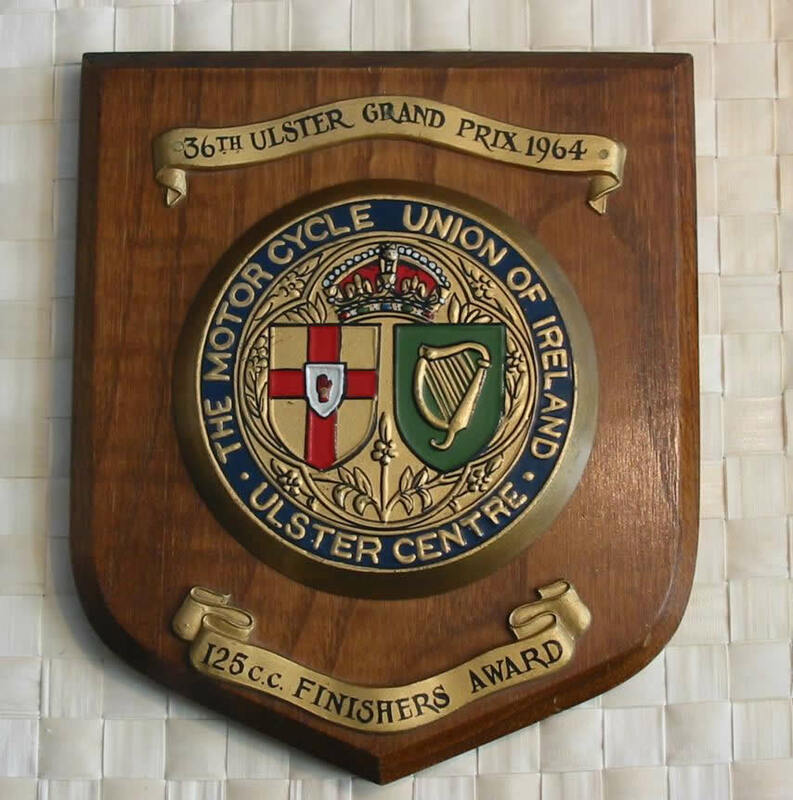 All though much work had already been done by Ron in preparation for us to build the short stroke 125 engine, it was clear that the engine and gear cluster could not be finished and tested in time for the Ulster G.P in only 2 weeks. However I had high hopes the work might be completed before the start of the end of season Spanish Series. The first of the 5 race meetings commencing in Bilbao, at the end of August. Visiting Croydon the following day, I reported to Cyril Ashford the Managing Director of Capriola/Parilla Imports, all of the high lights and problems, encountered over the previous 4 months of our racing program, the outcome of our discussions whilst staying with Parilla in March and subsequent visits to the factory. I also informed him of the progress Ron Kenwood was making on the engine and 6 speed gearbox cluster for the 125 Parilla. Cyril Ashford was concerned as to Moto Parilla’s future as a motorcycle manufacturer and supplier, but seemed very pleased with our results to date and assured me that I would continue to have his full support. Ashford also expressed concern that Moto Parilla may think the gearbox cluster now being developed with Ron Kenwood’s help, was of the same design as the cluster we had originally offered to jointly develop with Parilla for fitment into their Wildcat scramblers. His concern was Parilla (or their Bankers) may feel, at some time in the future, that they had some claim to the design. This was clearly not the case but to avoid any future misunderstandings it was agreed that we would keep the development of the 125 engine gearbox cluster under cover for the time being. This decision was to present us with some future additional problems when trying to install the gear/piston selector indexing mechanism, out of sight, under the 125 outer crankcase cover!! Arriving in Dundrod the day before the first free practice sessions were to begin, we parked and prepared to camp down in the circuit paddock for the duration of our stay. This was perhaps a bad decision as it was raining as we drove into the paddock and did not stop until 5 days latter when we were packing up to return to the UK. Most of the other competitors had wisely arranged accommodation away from the circuit! Not with standing the rain, I was very encouraged as we drove around the circuit on the evening of our arrival. 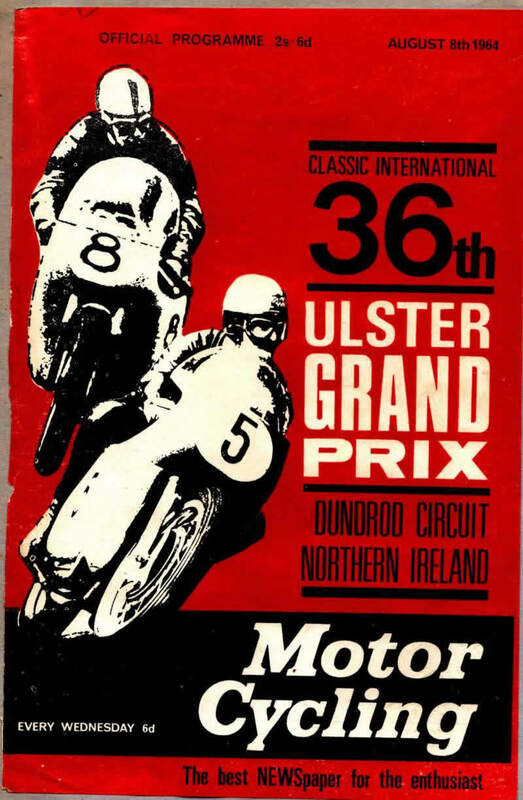 Dundrod was another real road racing circuit which reminded me a lot of the back roads between Ripley, East Horsley and the Triangle café at Send, in Surrey, where I used to ride and some times race with my pals, at speeds of up to 65 MPH, on my very fist motorcycle, a 197 Francis Barnett. 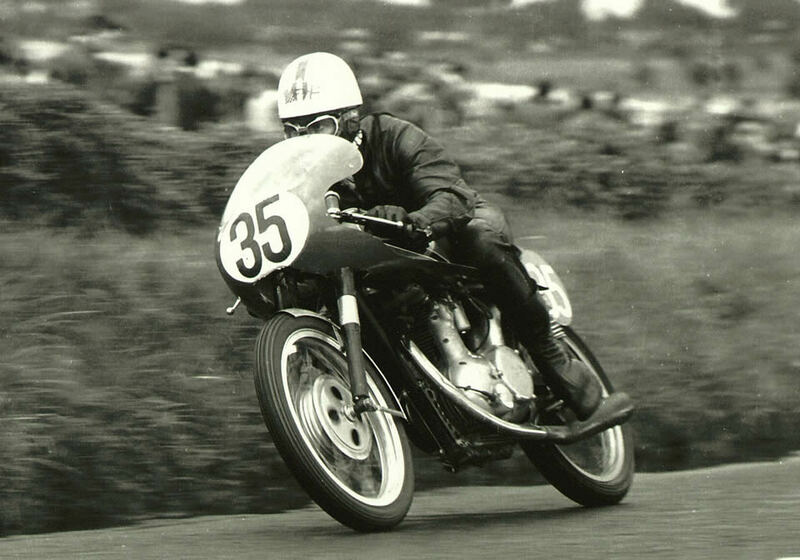 Reported to be still recovering from the injuries he sustained when he crashed out on the MZ at the Sachsenring, Mike Hailwood did not ride at the Ulster G.P in 1964. I felt very much at home on the circuit from the moment practice started. Most of my fellow competitors were, wisely perhaps, taking things very easy in view of the wet conditions, but I was still surprised at the number of riders I was overtaking, including some of the Works Suzuki and Honda riders! Knowing that it was only in the rain that I had any chance of getting higher up the practice leader board, I pushed on as fast as I could and was delighted to find, after the first timed practice sessions, I was listed in 6th place on the 125 and also just in the top 12 in both the 250 and 350 class early sessions. Impressed I think by my lap times and my determination, not withstanding the adverse conditions, to get in as many laps as possible, the organisers seeing that we and the bikes were getting drenched in the paddock, took pity on us by allowing our Parillas to be parked, out of the rain, at the back of the scrutineering tent, for the duration of the meeting, this was very much appreciated. Before the start of the 125 race, the rain had eased a little but the track was still very wet with standing water in many places. Having been pushed down in the final practice session from my initial 6th place, I was still high enough up the list to be on the 4th row with, for the first time ever, a number of Works riders still behind me! With perhaps my best ever start on the 125, I was right behind the 1st and 2nd row pack of riders which included Hugh Anderson, Perris, and Schneider on their Suzukis and the Hondas of Bryans, Taveri and Redman, as we left the starting grid and started the rush down the half mile straight towards Leathemstown corner. The plume of spray from the leading riders reduced visibility to well below 50 yards and because of all this spray, I kept hard over to the right hand side of the track where it was not so dense, I also did this to reduce the risk of running into the back of any seizing two strokes! On this occasion, I did not try to gain from any tows down the straights, as it would have been far too dangerous in the prevailing conditions. During practice I had seen just how much spray the bikes were kicking up and had observed how most of the riders were keeping to the left hand side of the track, as you would normally expect riders to do, when approaching Leathemstown Bridge. Many riders passed me down the straight, but some of them were getting into all sorts of difficulties with spluttering engines and even aquaplaning when hitting standing water which gave me a chance to get back one or two places. Although way down on power, I felt I had some advantages in these conditions, including riding a four stroke and having the very latest narrow section Dunlop triangular tyres which cut clean through most of the standing water and thus gave me added confidence. Fortunately I had decided for the first lap, to stay on the right hand side of the track when approaching Leathemstown Bridge, as the now leading group of 12 or so riders all seemed, to me, to be breaking very early as they lined up on the left hand side of the track to take the sharp right hander. 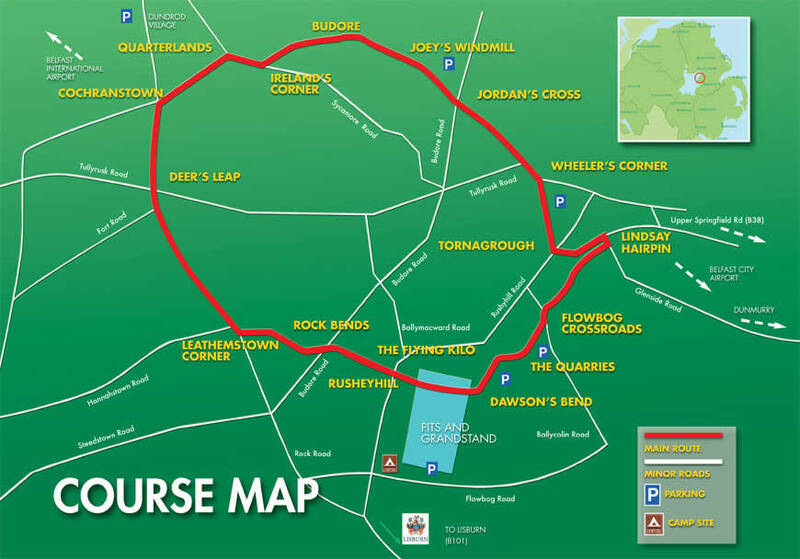 By staying on the right hand side of the track, I had a much clearer view of the riders and the bend in front of me and by leaving my breaking point to around 100 yards latter than the riders in front, I was able to pass a number of them on the inside line into the bend. The conditions were already bad when it started to rain heavily once again and I saw more than one Works rider falling or sliding off the track during the opening laps. Time and again, particularly in the early laps, I would overtake riders at the sharp right hairpin after Tornagrough and on the slower and twistier sections of the track, by out breaking, or riding faster through these sections, than some more cautious riders, only to have the same riders overtake me yet again as we came onto the straights. Although at times frustrating being overtaken by so many more powerful bikes down the straights, this was one of the most enjoyable races I had ever taken part in. Taking 10th place at the finish, my best placing in a World Championship race, on what was to turn out to be, my last race on the long stroke 125 Parilla. The ‘Steam Engine’ had served me well. The 11 lap race was won by Hugh Anderson on his Suzuki in 53 minutes 28 seconds, at an av speed of 147 km/h, followed by Taveri, Bryans, Perris, Schneider and Ramon Torras. There were only 11 finishers. The 350 race was next up when at the start the weather lightened up a little, however, the circuit was still wet in many places and I planned to keep to the same lines I had adopted both in practice and in the 125 race. This time further back on the grid than in the 125 race and on the outer end of the line, I nevertheless had a good start and with the improving visibility managed to get some useful tows down the straights behind AJS and Manx Norton riders. Jim Redman, Mike Duff and the other Works riders shot off from the start as expected and were out of sight by the time I and most of the other privateers had completed half a lap! RM on 256 Parilla at Leathemstown in heavy rain! At approximately two thirds distance into the race, all seemed to be going well when just after seeing my pit signal showing I was running in 17th place I began to get severe cramp in my right leg. I tried to relieve the pain by taking my leg off the foot rest and moving it forward against the engine and gearbox casing. I also tried trailing my leg but I just could not get rid of the pain. Much to my regret, as I could no longer change gear, I had to retire from the race on completion of the lap. Only once back in the paddock did I realized just how wet and cold I was, when discovering I could not even get off the bike without assistance. 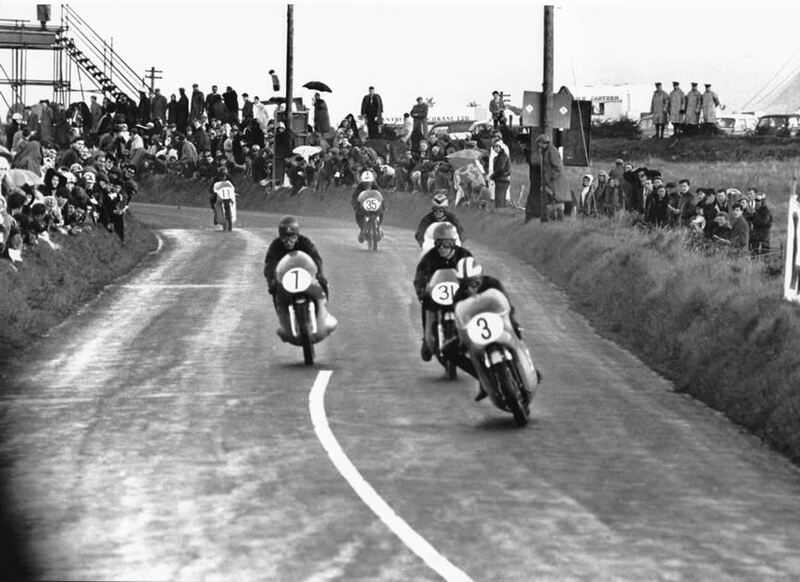 The 17 lap race was won by Jim Redman on his Honda in 1h, 20’ 38 seconds, at an av speed of 151km/h, followed by Mike Duff, Havel (Jawa) Beale (Honda) C Conn (Norton) and F Stevens (AJS) – 29 riders finished the race. This was also my last race on the 256 cc Parilla, as there were to be no 350 or 500 races in the end of season Spanish Series. Again the bike had served me well and the special Ina big end bearing, Parilla had fitted to the engine, as an experiment, back in April, was still running as good as new. 43 years later, in 2007, Mike McGarry and I were to find the same bike, frame No 250599, fitted with a stock Parilla Wild Cat engine and some other modifications, on display in Sammy Millers Museum in New Milton, Hampshire. I later sent a photo of the bike from 1964, to Sammy, for his collection. The next race up was the 250 when after a hot meal and putting my pyjamas on under my leathers for extra warmth, I sat in the Thames with the engine and heater running, right up to the time we were called to the starting grid. Again starting on the 4th row, this time on. the inside track end position. There were a host of Works riders in front of me including Phil Read. Jim Redman, Tommy Robb Ralph Bryans and others and directly behind was Alan Shepard on the Works MZ. I was a little surprised and amused when Alan came up to inform me of his intention to overtake me on the right hand side and requested that I should hold my line when starting and not move over onto the line he was indicating he planned to take. First lap of 250 race, Ralph Bryans (3) Works Honda followed by Alan Sheperd (7) Works MZ with RM (35)on his Parilla 5th inline at Rock Bends. My amusement came from knowing, as I discovered at the earlier Shleiz and Bautzen meetings in East Germany, that when I made a good start, my Parilla was initially and only initially, faster off the line than the Works MZs. It was now raining heavily again but with the drop of the starters flag we were off. Getting another good start, I was soon in the thick of things as we all rushed down the straight when, yet again, the faster Works riders began to pass me but Alan Shepard on his MZ had to wait until the end of the ‘Flying Kilometre’ to get past a Parilla! Again diving up the inside of riders who were in front of me as we approached the hairpin and the twistier parts of the circuit and then being overtaken time and again, on the straights, I followed the same plan as I had developed in the earlier races. At halfway distance, I got my first pit signal indicating that I was running in 19th position. As the race progressed with some riders crashing out, or retiring after breaking down, my position started climbing on each lap, even though I was not aware of having overtaken any riders on the previous lap. Knowing that I was now running out of laps as we approached full race distance, I pushed harder and harder and very nearly over did things drifting off line at Quarry Bends on what turned out to be the last lap. After this wakeup call, I was somewhat relieved to finish the race and take the flag in13th position. 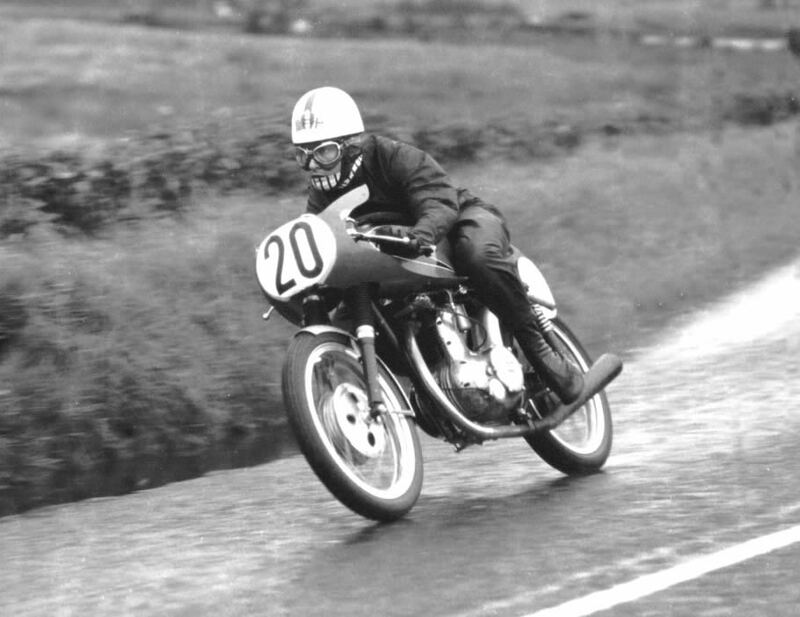 The 14 lap race was won by Phil Read on the Yamaha in 1 h, 12’ 30 seconds, at an average speed of 138 km/h followed by Redman, Bryans, Alan Shepard, Beale and Schneider.- 17 riders finished the race, and it was still raining! Immediately after the last race of the meeting, Vic and I were informed by one of the scrutineers who was apparently also a member of a committee appointed to adjudicate on nominations for the “Best Newcomers Overall Performance Award” by a privateer at the meeting, that I had been nominated and was one of the favourites in his opinion to get this prestigious award which, of equal interest to me, included a handsome cash payment! The cheque for the three starts was most welcome and needed for us to prepare and to complete our racing program for the year in Spain. I also received from the organizers 3 finishers’ awards, even though I had not completed the 350 race. Leaving Dundrod to catch the ferry, it was still raining!